The quickest and most concise method for watering many potted plants at one time is the Netafim 4-Way Assembly with Drip Sticks. Frequently used in nursery and greenhouse operations, these 4-way assemblies are placed on the outlet of a single drip emitter and the volume of flow is divided between the four drip tubes to water four different pots with one dripper. Netafim’s UV White™ PE Tubing produces cooler water temperatures which enhances plant growth. 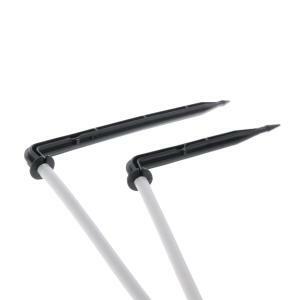 The short angle arrow sticks are perfect for 4" - 5" pots, while the standard angle arrow sticks work well in up to 1 gallon pots. *Please Note: Optimal performance is achieved with higher flow drippers such as 2 GPH or more. Keeping drip tube elevated above pots for complete draining after system shutdown will reduce clogging in the manifold micro-tubing from algae, bacteria, or other debris.